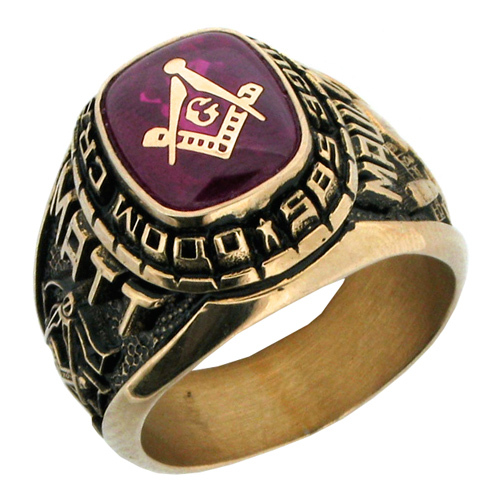 Personalize the Masonic Craftsman ring in 10kt yellow gold with stone color, wording around the stone, side emblems and engravings. Closed back, solid 10kt yellow gold. For a standard size 10, the Craftsman ring is 20mm across the widest part on top and 28mm from top of stone to bottom of ring shank. Simulated stone dimensions: 12mm x 10mm. Approximate weight: 15 grams. Choose your emblem and enter your engravings below. Enter your first name, year, or other personalized engraving. My first and only Blue Lodge Ring! Wife allowed me to buy one ring after being raised to Master Mason. Decided to go with a more traditional 'class ring' style. This option allowed me to customize perfectly to suit my own tastes, while also filling me with nostalgia for my high school/college years. Make no mistake. This is a man's ring and has some mass - but it fits beautifully (ArtCarved styles are timeless and comfortable). Glad I read the reviews and went with the fire blue spinel. Absolutely perfect workmanship! Nicely done...and worth the wait. Extremely happy with the ring. This ring was given as a retirement gift to my husband. It was everything we hoped for. It is very attractive, well made and fits perfectly. Thank you so much for your craftsmanship and quality product. It was a very beautiful piece to own and I glad that I purchased my ring from this company!!! Received many compliments, very well satisfied. What a great ring! Absolutely beautiful, high quality craftsmanship, I will be proud to wear this ring for years to come. This ring is much better looking that I expected! Will be proud to wear this in the lodge! I really love this fratenal ring! Extremely happy with this ring's looks and workmanship. It is personalized for me. I agree with one of the other reviewers that since it is a large closed back ring, it should be ordered larger. It is a jeweled item that I am very proud to wear daily. I absolutely love my ring.....great craftsmanship, fully customizable. It is talk of the lodge. Thanks joy jewelers.